"Saratoga County" redirects here. For other uses, see Saratoga County, Jefferson Territory. New York's location in the U.S.
Population quoted is 2015 U.S. Census estimate. 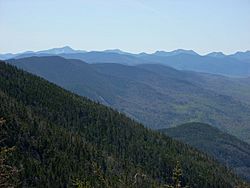 Highest elevation: 2,675 ft/815 m (Hadley Mountain), in the Adirondack Mountains. Lowest elevation: 69 ft/21 m, at the confluence of the Hudson River and the Mohawk River. Saratoga County is a county in the U.S. state of New York. As of the 2015 U.S. Census estimate, the county's population was 226,249, representing a 3.0% increase from the 2010 population of 219,607, representing one of the fastest growth rates in the northeastern United States. The county seat is Ballston Spa. Saratoga County is included in the Capital District, encompassing the Albany-Schenectady-Troy, New York Metropolitan Statistical Area. 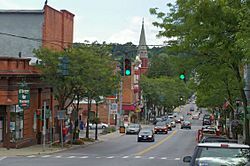 Saratoga County's name was derived from the Native American word "sah-rah-ka", or "Sarach-togue", meaning "the hill beside the river", referring to the Hudson River bordering the county on its eastern flank and the Mohawk River delineating its southern border. Saratoga County, bisected by the toll-free, six-lane Adirondack Northway, serves as an outdoor recreational haven and as the gateway to the Adirondack Mountains and State Park for the populations of the Albany and New York City metropolitan areas. The county is also home to the internationally renowned Saratoga Race Course, one of the oldest venues in horse racing. Saratoga County lies at the heart of eastern New York State's recognized Tech Valley, a growing center for the computer hardware side of the high-technology industry and its concomitant venture capital investment, with great strides in the nanotechnology sector, digital electronics design, and water- and electricity-dependent integrated microchip circuit manufacturing, involving companies including IBM, GlobalFoundries, Samsung, and Taiwan Semiconductor, among others. The "Fab 8" campus of GlobalFoundries, a company specializing in the semiconductor industry, is a multibillion-dollar venture being developed in Saratoga County. 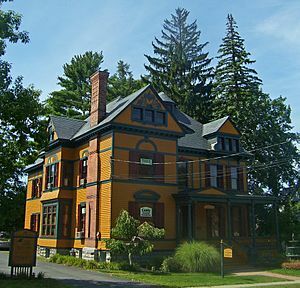 The historic Verbeck House in Ballston Spa. When counties were established in the Province of New York in 1683, the present Saratoga County was part of Albany County. This was an enormous county, including the northern part of New York State as well as all of the present State of Vermont and, in theory, extending westward to the Pacific Ocean. This large county was progressively reduced in size by the separation of several counties until 1791, when Saratoga County as well as Rensselaer County were split off from Albany County. The Battles of Saratoga (September 19 and October 7, 1777) marked the climax of the Saratoga campaign, giving a decisive victory to the Americans over the British in the American Revolutionary War. During the nineteenth century, Saratoga County was an important industrial center. Its location 30 miles north of Albany on the Delaware and Hudson Railway, as well as its proximity to water power from the Hudson River and the Kayaderosseras Creek, led to rapid industrial development beginning in the early nineteenth century. Some of the most important industrial employers were paper mills, tanneries, foundries, and textile mills. Since the construction of the Adirondack Northway in the 1960s, Saratoga County has consistently been the fastest-growing county in the Capital District and indeed, in Upstate New York, and one of the fastest-growing in the U.S. Northeast. The county has historically maintained a low county tax rate; according to its official website, Saratoga County levies one of the lowest county tax rates in New York State. Saratoga County is situated in the eastern portion of New York State, north of Albany, northwest of Troy, and east of Utica. According to the U.S. Census Bureau, the county has a total area of 844 square miles (2,190 km2), of which 810 square miles (2,100 km2) is land and 34 square miles (88 km2) (4.0%) is water. The Hudson River forms the eastern border of the county, while the Mohawk River demarcates its southern border. The highest elevation in Saratoga County is at the peak of Hadley Mountain in the Adirondack Mountains, at 2,675 feet (815 meters), while the lowest elevation is 69 feet (21 meters), at the waterfront of the Village of Waterford, at the confluence of the Mohawk and Hudson rivers. In 1960, Saratoga County had a population of only 89,000, less than half of its population in 2015, estimated at 226,249. As of the 2010 United States Census, there were 219,607 people, 88,296 households, and 58,814 families residing in Saratoga County. The population density was 271 people per square mile (105/km²). There were 98,656 housing units at an average density of 122 per square mile (41/km²). The racial makeup of the county was 94.3% White, 1.8% Asian, 1.5% Black or African American, 0.2% Native American, 0.0% Pacific Islander, 0.5% from other races, and 1.7% from two or more races. 2.4% of the population were Hispanic or Latino of any race. There were 88,296 households out of which 29.5% had children under the age of 18 living with them, 53.3% were married couples living together, 9.1% had a female householder with no husband present, and 33.4% were non-families. 26.1% of all households were made up of individuals, 31.5% of households had individuals under 18 years, and 9.5% had someone living alone who was 65 years of age or older. The average household size was 2.44 and the average family size was 2.96. Of Saratoga County's population in 2010, 6.3% were between ages of 5 and 9 years, 6.7% between 10 and 14 years, 6.5% between 15 and 19 years, 5.5% between 20 and 24 years, 5.5% between 25 and 29 years, 5.8% between 30 and 34 years, 6.6% between 35 and 39 years, 7.9% between 40 and 44 years, 8.5% between 45 and 49 years, 8.0% between 50 and 54 years, 7.0% between 55 and 59 years, 6.4% between 60 and 64 years, and 13.7% of age 65 years and over. 22.7% of the county's population was under age 18. The median age was 40.9 years. According to the 2009-2013 American Community Survey, the median income for a household in Saratoga County was $69,826, and the median income for a family was $87,058. Males had a median income of $59,636 versus $44,743 for females. The per capita income for the county was $35,176. About 4.0% of families and 6.5% of the population were below the poverty line, including 7.4% of those under age 18 and 6.1% of those age 65 or over. 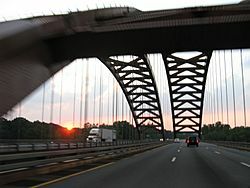 The Thaddeus Kosciusko Bridge, crossing the Mohawk River, is the portion of the toll-free, six-lane Adirondack Northway that connects Halfmoon in Saratoga County to Colonie in Albany County. A Saratoga and North Creek Railway train at the Saratoga Springs Amtrak station. 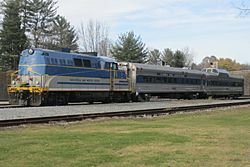 This railway service operates between Saratoga County and the Adirondack Park. The toll-free, six-lane Adirondack Northway bisects Saratoga County, running in a south-north direction. This highway, designated Interstate 87, is the primary conduit connecting the capital of New York State, Albany, northward across the Thaddeus Kosciusko Bridge into and through Saratoga County, then past Lake George in the Adirondack Park, through the Adirondack Mountains, and eventually to the Canada–United States border, where it continues seamlessly as Quebec Autoroute 15 to Montreal. This freeway has been a major catalyst for the growth of population and commerce in Saratoga County. The Saratoga and North Creek Railway is a heritage railway that began operation in July 2011 and currently operates between the Saratoga Springs Amtrak station at its southern terminus and North Creek in the Adirondack Park at its northern terminus, where it connects with Amtrak's Ethan Allen Express and Adirondack services. Its commercial operations were originally built by the Adirondack Railway. Northwestern Saratoga County serves as the southern gateway to the Adirondack Park, with the higher peaks of the Adirondack Mountains further north. 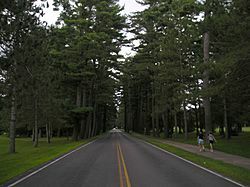 Towering trees line the Avenue of the Pines in Saratoga Spa State Park. An entrance to the Saratoga Race Course in Saratoga Springs. The Broadway Historic District in Downtown Saratoga Springs. 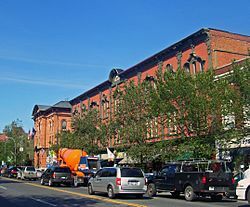 The historic Village of Ballston Spa is the county seat of Saratoga County. The Town of Malta, home to the "Fab 8" campus of GlobalFoundries, a semiconductor foundry. 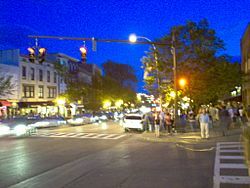 Nightlife on Broadway in Saratoga Springs. 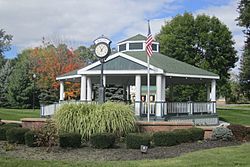 Saratoga County is extremely popular between late July and early September each year due to the Saratoga Race Course being open. This world-famous track dates back to 1863. Thoroughbred horse racing in the United States has its own Hall of Fame in Saratoga Springs, which honors remarkable horses, jockeys, owners, and trainers. Horse-racing fans come from all over to watch the races. The Saratoga National Historical Park is located along the Hudson River in Stillwater, and features a drive-around trail where one can drive up to each station. The park is also famous for its outstanding views of the area's natural scenery and Vermont's Green Mountains in the distance. The Saratoga Spa State Park capitalizes on the culture and the mineral springs that once drove Saratoga County. This is a large state park and includes a hotel, 2 pool complexes, mineral baths, Saratoga Performing Arts Center, picnic areas, hiking trails, and numerous mineral springs. Saratoga County serves as the southern gateway to the Adirondack Park, the largest park in the contiguous United States, covering approximately 6.1 million acres (2.5×10^6 ha), a land area roughly the size of Vermont and greater than the areas of the National Parks of Yellowstone, Grand Canyon, Glacier, and Great Smoky Mountains combined. A portion of northwestern Saratoga County lies within the boundaries of the Adirondack Park and includes Hadley Mountain. Saratoga County Airport, Saratoga Springs. The logo of the environmentally sustainable Luther Forest Technology Campus, housing the GlobalFoundries Fab8 campus in Malta, Saratoga County, within Tech Valley. Saratoga County, New York Facts for Kids. Kiddle Encyclopedia.